“The supremely exotic flowers of ‘Queen Red Lime’ are certainly thrilling in their pastel shades of red/pink, brushed with lime green. The flowers are very imposing, either in the garden or a large container. Even though they are from warmer countries, they grow amazingly well if given free drainage and full sun. Try combining ‘queen red lime’ with achillea and gypsophila for a beautiful ‘on trend’ mix’.” Height 60cm (24”). Rob's Thrillers - Fillers are the ‘can can’ girls of the arrangement, they look impressive but they are there to support the Thriller. They also help ‘fill out’ the arrangement and make it look bigger and bolder. Sow in 7.5cm (3") pots, 0.5cm (½") deep in March-May in a propagator at 20-25°C (68-77°F), or a clear plastic bag on a sunny windowsill. Once germinated (14-28 days), take the lid off, or remove the bag. Can be direct sown in May-June, into weed-free, warm soil. Do not over water, or water foliage as plants can suffer from botrytis if too wet. Final spacing should be 30cm (12"). 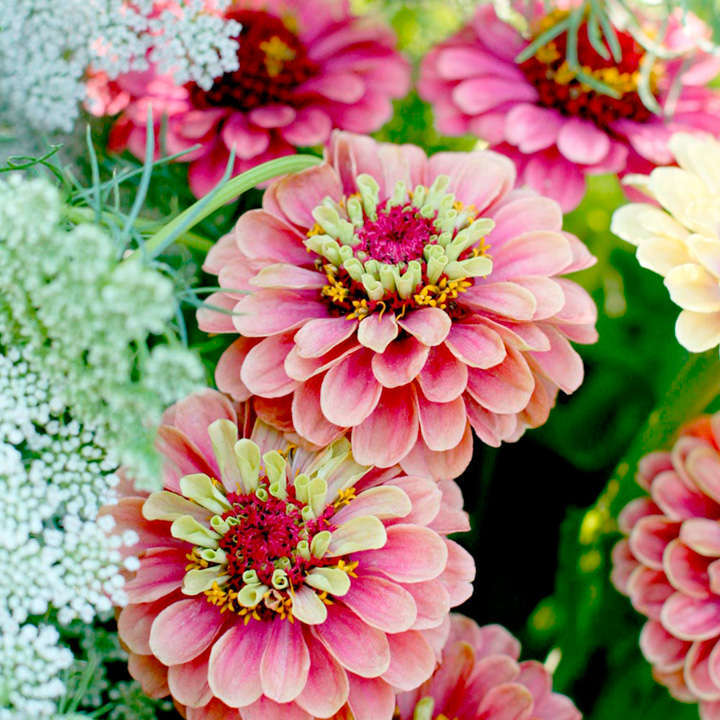 Zinnia hate root disturbance, so if growing in pots, be very careful when planting out.